In the heart of the White Mountains in scenic Jackson, The Riverhouse located on the banks of the Ellis River is available for rent monthly, weekly or nightly, with a two night minimum. Hiking, climbing, golf, tennis, biking, fly fishing, skiing all close by. Walk to galleries, shops, and restaurants in the quaint, exclusive village of Jackson. Just a stones throw from the Jackson Covered Bridge and only one mile from Storyland. Settler's Green Outlet complex and North Conway village are just 8 miles south on Route 16. Slate tile floors, glass shower doors. A 15 minute drive south to the larger village of North Conway, with shops restaurants and entertainment galore. In the heart of the Mount Washington Valley. Within easy walking distance of the Resort Loop of Jackson Villlage and the Wentworth Golf Club. Nestled among the White Mountains with Mount Washington just 10 miles up the road. Otters, blue herons, kingfishers, ducks and geese pass by along the hidden corridor of the Ellis River behind the open backyard. Over 500' of riverfront access. Property abuts the Ellis River. Popular area for fly fishing. AC for each bedroom and main livingroom area. Forced hot water, baseboard units throughout. Plenty of bath towels. Bring beach towels for outside use. Open concept, kitchen, dining, living room. 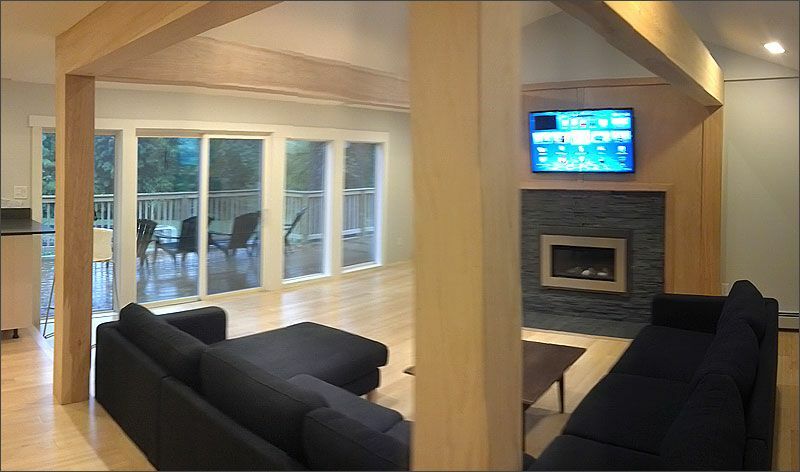 Large sectional sofa facing fireplace with internet and flatscreen television. Stainless refrigerator, freezer on top. Bosch cooktop, oven and microwave unit. Keurig with resuable basket for use with ground coffee. Double toaster, has four slots. 46' Led Samsung mounted over fireplace. Some family games, cards, etc. Large backyard that abuts the Ellis River. Plenty of room to store bicycles in the garage. Modern, sleek, immaculate, convenient location. Beautiful house with great views out the back with sunshine streaming in the windows (sorry, no moose sighting from the water on the property. At least 8 ski areas within an hour’s drive (including Sunday River, ME). Everything new & working. Fans in each BR used to help block noise (traffic, snoring!). Plenty of towels & paper products. The owners thought of everything. The house was impeccably clean, well stocked, warm and inviting. Loved how bright the living area is. Although we didn't cook there, it looked like there were tons of dishes and utensils for just about anything you could think of. The beds were incredibly comfortable. The one tiny thing I wish I had was a suitcase stand, as there was no dresser in the room with the queen bed. (It would've made searching through my suitcase a bit easier.) Would love to experience this place in warm weather, as the river is close by in the back yard and the deck was beautiful. Perfect house and location for two couples celebrating a low key New Years Eve. Had everything needed to make a dinner at home, and plenty of places to go around for a drink. Our stay exceeded my expectations. The house was very comfortable and clean. The owners were for quick to respond on any issue. The backyard was nice and large, and the deck is great. The location is great for visiting the nearby areas. We had no complaints and I would highly recommend this house! I was a little worried about the proximity of the road to the house when we first arrived, but the traffic was not noticeable once we got inside the house. What a great house. The rooms were homey, cozy, nicely decorated. The kitchen is fully appointed with all new utensils, dishes, pots, etc. We wanted for nothing. Especially loved the bedrooms & bath with their comfy beds, fluffy towels & soaps. We stayed in 5 east coast VRBO's on this trip & this house was the best outfitted, by far. Red Fox Pub across the street has excellent food too! Superbly clean, well appointed cottage. Everything you could want in a great position. The cottage was lovely and clean when we arrived. Everything works well and is just what you need. Jackson is a good place to be for visiting all the attractions and days and days of leaf peeping in the White Mountains. We made use of the fire pit and shared the garden with the wildlife - squirrels, woodpecker, raccoon. If the accommodation is the right size for you don’t hesitate to book it. Just a mile north of Storyland. Twelve miles to Mt. Washington Auto Rd./ Great Glen Trails. Wentworth Golf Resort within walking distance. Eagle Mtn. House Golf Course 1 1/2 mile.